The valley of food, fast cars, music, and Shakespeare. Emilia Romagna is a culinary paradise; the birth place of balsamic vinegar, parmesan cheese, and prosciutto ham. 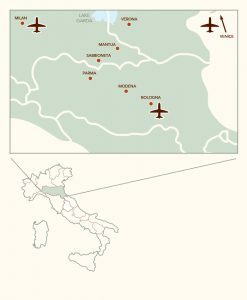 Our tour is set in the largest fertile plain of Italy, the Po River Valley, a significant agricultural area since ancient times. 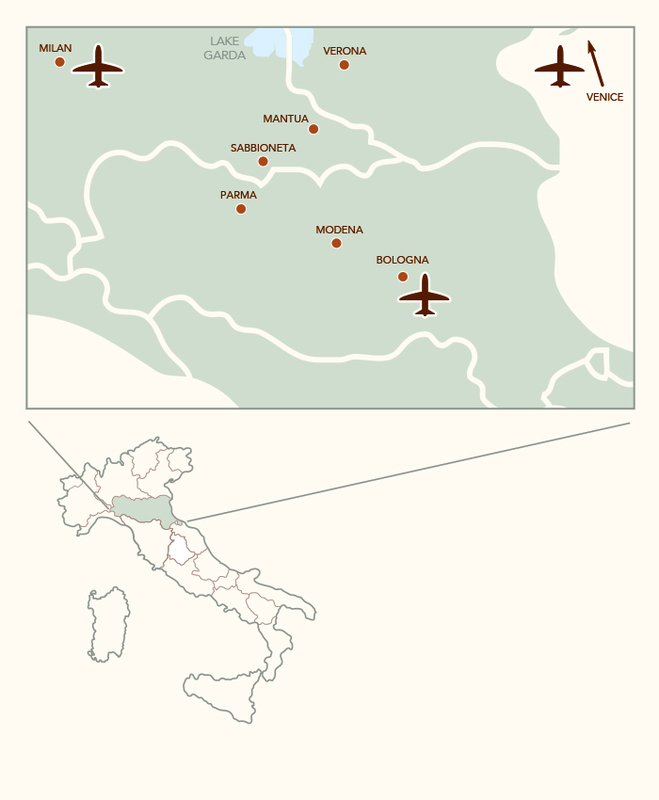 The Romans saw the potential of this region and built the 260 kilometer Via Emilia route in 187 BC. The route (now known as the SS9) united two regions and inspired excellence. It is a region proud of its music; home to 19th century composer Giuseppe Verdi and to opera’s much loved tenor, Luciano Pavarotti. This is the setting for several Shakespeare plays. And, the region is graced by the top sports cars and motorcycles also born here: Ferrari, Maserati, Lamborghini, Ducati, and Morini. There is excellence appealing to every interest. And we look forward to share it with you. Do you have a different date in mind? Email us the tour and dates that work for you. Savor artisanal productions of balsamic vinegar, prosciutto hams, and organic parmesan. Explore the beautiful Duomo of Parma, a sacred atmosphere shaped by architecture, history, and grand frescos. Discover Italy’s fantastic sports cars: a private Maserati collection and the Ferrari museum. Day 1 – Welcome to Italy! Welcome to Mantova! A beautiful Renaissance town embraced by the Po River and the setting of Romeo’s banishment (from Shakespeare’s Romeo and Juliet). After a welcome with your Siciclando representative, we will have a guided tour of the city. Enjoy an Aperol Spritz in the 16th Century main square as people walk and bike by. We will have dinner together. Today we begin biking from Mantova in the direction of its sister city, Sabbioneta. These two towns became UNESCO sites in 2008 due to their Renaissance town centers. Our route threads through small villages spiked with a church tower overlooking terracotta rooves amidst green fields. Once in Sabbioneta consider a visit to the Teatro Olimpico with frescoes by Veronese, the Church of Santa Maria Assunta or the Palaces of Ducale and Giardino. At the end of our ride we will transfer to a charming castle in the middle of the countryside where we’ll spend two nights. We look forward to share several collections and surprises of the castle. Breakfast is included today. Bike the peaceful countryside at your own pace! The landscape is ever changing between farms and vineyards. The quiet roads that coast up and down make for a wonderful day. In the afternoon we will go to a historical inn where we can see the aging of the typical ham of the region – the prized culotello – a good place for an aperitivo! Breakfast and dinner are included today. This morning we will cycle from the Locanda to the city of Parma, an important city of the Region. Explore Parma on our walking tour and see the 900-year old Duomo and adjacent museum, which houses several magnificent statues including King David, the Queen of Sheba, and King Solomon. Choose from one of the cafés for a typical Italian lunch. Breakfast is included today. Today we will start with a shuttle to the next accommodation, then you can choose between a wonderful and challenging loop in the Emilia countryside or relax in the lovely Opera 02 Hotel – the views and the atmosphere are fantastic. The hotel has an amazing restaurant – the chef is a master of flavors and makes every plate look like a work of art. The sommelier can explain the production of the regions Lambrusco wines. Breakfast and a picnic lunch are included. Day 6 – Biking and balsamic vinegar! We will enter into the area of Modena, home to balsamic vinegar and another UNESCO Heritage Site. Enjoy the wonderful up and down hills of the bike route! Prepare your taste buds for a balsamic tasting with our delightful hostess Signora Giovanna. She will share the interesting history of this highly-valued vinegar and the secrets to a real balsamic. Breakfast and dinner are included. Day 7 – Organic parmesan – meet the cows, taste the cheese! This is another of our favorite stops! We will begin with a visit to the farm and factory in the morning, the time when the cows are milked and the production begins. We will then taste the parmesan which is aged at 12, 24, and 36 months. The tasting takes place in a private collection of Maserati sports cars, the only one in existence. From here we will start our bike ride in the direction of Bologna, then in the afternoon enjoy a guided tour of the city! Breakfast is included today. Day 8 – Hills of Bologna! Today we will have the chance to explore the hills around Bologna! This is a beautiful bike ride with varied terrain – hills, fields, and forests. Once back to Bologna you will have enough time to relax and discover the city on your own. Walk the colorful porticoes and discover the city squares framed with churches and villas. We will enjoy great mamma (and papa) food at our favorite family-run restaurant: Handmade pasta. Savory sauces. Slow-roasted meats. And homemade desserts. Breakfast and dinner are included. We have been on six spectacular Siciclando bike tours, each one memorable and leaving us wanting more. Last year our custom tour of Emilia Romagna introduced us to the best rides and best views we have experienced. Who knew it could get better! We look forward to our 2019 tour. Siciclando carefully chooses every aspect of a tour, including the accommodations. Our choices are based on comfort and quality. We often choose hotels that are family-owned and operated because they provide a richer experience and because it is important to us to support the efforts of these individuals. We have developed relationships with many wonderful hotel operators. Here is a sample of the hotels on this tour for the “guided” version (please, ask us the hotel list for the “self guided” version which, due to the logistic, may be different). Tour accommodations will be based on availability and the time of year. Once you have made your final payment for the tour, we will send you a confirmation letter that includes daily accommodations and contact information. What do our guests say about touring with Siciclando? What does Leisure, Active, and Avid Cyclist mean? See how we define each and be assured that we support all levels each tour. There is a place for you on a Siciclando tour. See what you can expect from us on a Siciclando bike tour.